Cold Spring Harbor, NY — Pancreatic cancer has a grim prognosis. It is usually detected after the disease has spread, and chemotherapy tends to do little to slow the cancer's growth. Even with treatment, most patients live only about six months after they are diagnosed with the disease. Researchers in Professor David Tuveson's laboratory at Cold Spring Harbor Laboratory (CSHL) think it's possible to do better with a different type of treatment. Part of the problem, they say, is that cancer cells in the pancreas are protected by the dense matrix that surrounds them. The matrix is a mixture of extracellular components and noncancerous cells known as the stroma. All solid tumors contain stroma. In pancreatic cancers, this fibrous material is particularly abundant, making up nearly 90 percent of a tumor's mass. This stroma impedes anticancer drugs' from getting to their targets. Additionally, stromal cells secrete factors that actually help the tumors grow. Overcoming the stroma's protective influence has been challenging, but new leads from Tuveson's team, as reported on October 26, 2018 in the journal Cancer Discovery, point to a promising strategy. In fact, the new findings suggest that drugs which target the right cellular pathways can do more than just thwart tumor-supporting cells in the stroma. They may recruit them into the anticancer fight. A key element of the stroma is a type of cell called a fibroblast. Fibroblasts manufacture the stroma's connective tissue. They also generate factors that promote cancer cell growth and prevent the immune system from attacking the cancerous cells. Last year Tuveson's team discovered that the stroma of pancreatic tumors contains at least two types of fibroblasts. One type show features known to support tumor growth, the other type appear to have the opposite effect. The good news is that the fibroblasts' identities are not fixed. 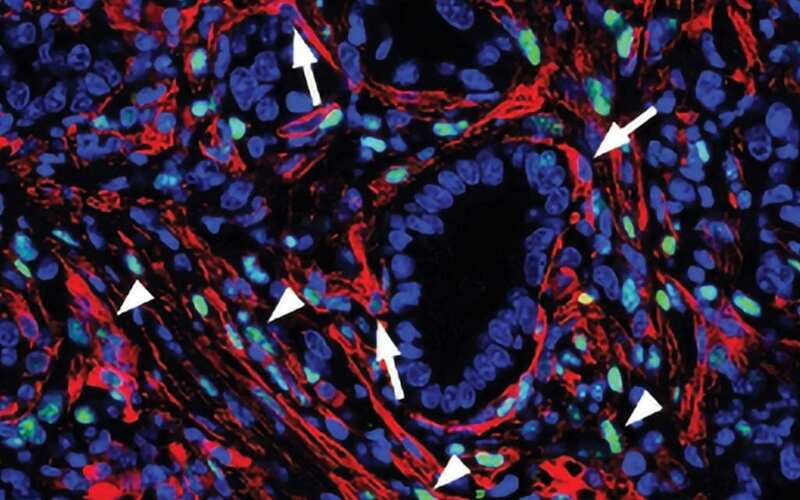 With the right cues, tumor-promoting fibroblasts can become tumor-restrictors. "These cells can convert into one another, depending on the cues they get from the microenvironment and from the cancer cells," explains Giulia Biffi, a postdoctoral researcher in Tuveson's lab who led the new study. "This is potentially useful because, in theory, you can shift the tumor-promoting cells to tumor-restraining, rather than just depleting the tumor-promoting cells." In this new report, Biffi and her colleagues have identified specific molecular signals released by cancer cells that determine fibroblasts' character within pancreatic tumors. They have discovered that one such molecule, IL-1, drives fibroblasts to take on a tumor-promoting identity. They have also shown how another molecule, TGF-beta, overrides that signal and keeps fibroblasts in a potentially anticancer state even when IL-1 is present. The researchers are now exploring what happens to pancreatic tumors when they manipulate IL-1 and TGF-beta signaling and convert tumor-promoting fibroblasts to a more beneficial state. They will also investigate what happens when they target these pathways in combination with chemotherapy or cancer immunotherapies. Ultimately, Biffi says, patients may benefit most from a combination of therapies that target both the cancer cells and parts of the microenvironment that support their growth.